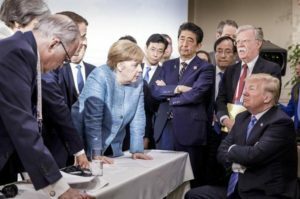 Can we all agree, the only thing Donald Trump cares about is keeping the spotlight on himself – that’s the only reason he refused to sign the G-7 closing statement? Can we all agree, Mr. Trump has no unified policy goals, can’t handle criticism and can only respond with name calling? German Prime Minister Angela Merkel explains it all to Mr. Trump. Can we all agree, it was quite a week in sports: a new Stanley Cup owner, repeat NBA champions and a Triple Crown winner? Can we all agree, Melania’s ‘minor surgery’ suddenly got a lot more serious? Can we all agree, The Pope seems to be the only world leader who can get the attention of the CEO’s who will ultimately change the world’s climate? Can we all agree, Special Counsel Robert Mueller is using every charge he can muster to force Paul Manafort to flip on Mr. Trump? Can we all agree, Mr. Trump delights in annoying Attorney General Jeff Sessions, by changing the nation’s marijuana policy with an off-hand comment? Can we all agree, there will finally be a House vote on immigration policy? Can we all agree, suicides byAnthony Bourdain and Kate Spade will force the nation to focus on the increase in the county’s suicide rate? Can we all agree, the most ominous part of the arrest of former Senate aide for spying was the seizing of a reporter’s notes? Can we all agree, by refusing to defend the Affordable Care Act’s very popular pre-existing condition provision, the AG has handed the Democrats a powerful campaign tool – even in red states? Can we all agree, Muhammad Ali does not need a pardon – Mr. Trump is just pandering in a desperate attempt to win over African-American voters? Can we all agree, separating families, whether they come here illegally or not, is just inhumane? Can we all agree, Tuesday’s election results show that Democratic voters remain energized? Can we all agree, the cancellation of the White House visit by the NFL Champion Philadelphia Eagles, probably ends the practice for all sports teams? Can we all agree, Former President Bill Clinton, should just shut up? Can we all agree, elimination of the Miss American swimsuit competition may have been the politically correct move, but if will not help the pageant’s TV ratings? Can we all agree, while reporters focus on EPA administrator Scott Pruitt’s ethical lapses, he is working to allow chemical companies to poison us? Can we all agree, Facebook continues to get bad press for selling information to anyone who wants it, but Americans don’t seem to care? Can we all agree, Mr. Trump knows he will be charged with a crime in Mr. Mueller’s Russia investigation – why else would he protest so much? I can’t imagine what it must have been like for Washington Post columnist Charles Krauthammer to write this. Can we all agree, now that Donald Trump has launched himself into the middle of the Syrian civil war, the real test will be his long term strategy? Can we all agree, like so many other campaign slogans, ‘America First’ seems to have fallen by the wayside? Can we all agree the Republicans wasted no time leaving Washington to avoid a debate on the legality of Mr. Trump’s actions? Can we all agree Russia’s rather muted reaction suggests they at least gave tacit approval to Mr. Trump? First Lady Malania Trump’s official portrait has caused a bit of a stir. Can we all agree Mr. Trump’s timing made sure no one was paying attention to the Senate’s approval of Neil Gorsuch as a Supreme Court Justice or Mr. Trump’s summit with the Chinese President? Can we all agree, unless Mr. Trump can end the infighting among his White House staff, he has little chance of scoring any more domestic victories? Can we all agree, we may have no choice but to believe Ivanka Trump when she asks us to ‘trust her’ to keep her father in check? Can we all agree Mr. Trump seems to have convinced his supporters that nepotism and corruption are just what the country needs to advance his agenda? Luckily the rest of the nation doesn’t seem to be buying it. Can we all agree someone needs to explain to Mr. Trump some basic facts about how his own government collects statistics? Can we all agree he will need a unified team if the economy continues to lose steam as the most recent jobs report suggests? Can we all agree, now that the GOP health care plan remains stalled, many supporters are wondering if he can pass an infrastructure bill? Can we all agree Senate Majority leader Mitch McConnell does not care about governing, just about winning? Can we all agree when GOP lawmakers hear about their new healthcare plan to eliminate coverage for pre-existing conditions last month’s town hall protests will seem tame? Can we all agree, speaking of road work, the California legislature gave Governor Jerry Brown a nice birthday present passing a $52 billion tax package to fix the states roads and bridges? It appears they think no one will notice when the gasoline tax jumps 12 cents per gallon. Can we all agree Gov. Brown was stating the obvious when he declared the state’s drought over? Can we all agree the spectacular pace of news has also overshadowed more of Mr. Trump’s false claims against the Obama administration and more details about when the Russians began their attacks on our political system? Can we all agree Rep. Devin Nunes has made himself a footnote to the House and Senate probes into the Russian meddling? Can we all agree AG Jeff Sessions seems to having some problem getting the courts to back up his plan to undo consent decrees with police departments around the country? Can we all agree Mr. Sessions bears a strong resemblance to former Laugh-In actor Arte Johnson? Can we all agree the tentacles of the scandal never seems to end? This week even Education Secretary Betsy DeVoss and her brother were caught in the act. Can we all agree Mr. Trump’s plan for extreme vetting of visitors to the US, by searching their cell phones and tablets will have a major impact of tourism? Can we all agree no country can be really protect itself from terror attacks when trucks become weapons? Can we all agree it’s really hard to believe how tone deaf some marketing folks can be when they create major ad campaigns that have to be scrapped as soon as they are unveiled? Can we all agree it’s incredible that no matter how many lawsuits Mr. Trump settles, there’s always another one to deal with? Can we all agree Fox News star Bill O’Reilly has been remarkably restrained as advertisers abandon his sinking ship over reports that the network has paid millions to settle sexual harassment suits against him? Can we all agree Mr. Trump’s well publicized gesture to donate his first paycheck to the National Park Service is pretty empty when you consider the $1.5 billion budget cut the Interior Department is facing? Can we all agree Mr. Trump’s support of Egyptian strongman Abdel Fattah el-Sisi was pretty repulsive, but it’s really no different than the legions of dictators the US has supported in the past, if it served our purpose? Can we all agree it seems a bit shortsighted for the NHL to skip next year’s Winter Olympics in South Korea and miss an opportunity to introduce the best hockey players in the world to the Far East? Can we all agree Don Rickles will never be duplicated? Take a look at the NCAA Trump-quotation brackets and see if you agree with the most remarkable Trump quote…so far. The unbelievable story go a young girl found living with monkeys.